For other uses, see Toast (disambiguation). Toast is a form of bread that has been browned by exposure to radiant heat. This browning is the result of a Maillard reaction altering the flavor of the bread and making it firmer so that it is easier to spread toppings on it. Toasting is a common method of making stale bread more palatable. Bread is often toasted using a toaster, but toaster ovens are also used. Though many types of bread can be toasted the most commonly used is "sliced bread", referring to bread that is already sliced and bagged upon purchase and may be white, brown, multigrain, etc. Toast is commonly eaten with butter or margarine, and sweetened toppings, such as jam or jelly. Regionally, savory spreads, such as peanut butter or yeast extracts, may also be popular. When buttered, toast may also be served as an accompaniment to savory dishes, especially soups or stews, or topped with heartier ingredients like eggs or baked beans as a light meal. Toast is a common breakfast food. While slices of bread are most common, bagels and English muffins are also toasted. Scientific studies in the early 2000s found that toast may contain carcinogens (acrylamide) caused by the browning process. The word "toast", which means "sliced bread singed by heat", derives from the Latin torrere, "to burn". The first reference to toast in print is in a recipe for Oyle Soppys (flavoured onions stewed in a gallon of stale beer and a pint of oil) that dates from 1430. In the 1400s and 1500s, toast was discarded or eaten after it was used as a flavoring for drinks. In the 1600s, toast was still thought of as something to be put into drinks. In his 1602 play The Merry Wives of Windsor, Shakespeare gives Falstaff the line: "Go fetch me a quart of sack; put a toast in't." By the 1700s, there were references to "toast" as a gesture that indicates sexual attraction for a person: "Ay, Madam, it has been your Life's whole Pride of late to be the Common Toast of every Publick Table." Toast has been used as an element of American haute cuisine since at least the 1850s. In a modern home kitchen, the usual method of toasting bread is by the use of a toaster, an electrical appliance made for that purpose. 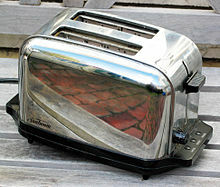 To use a modern toaster, sliced bread is placed into the narrow slots on the top of the toaster, the toaster is tuned to the correct setting (some may have more elaborate settings than others) and a lever on the front or side is pushed down. The toast is ready when the lever pops up along with the toast. If the bread is insufficiently toasted, the lever can be pressed down again. Bread toasted in a conventional toaster can "sweat" when it is served (i.e. water collects on the surface of the cooled toast). This occurs because moisture in the bread becomes steam while being toasted due to heat and when cooled the steam condenses into water droplets on the surface of the bread. It can also be toasted by a conveyor toaster, which device is often used in hotels, restaurants, and other food service locations. It works by having one heating element on the top and one on the bottom with a metal conveyor belt in the middle which carries the toast between the two heating elements. This allows toast to be made consistently as more slices can be added at any time without waiting for previous ones to pop up. Bread can also be toasted under a grill (or broiler), in an open oven, or lying on an oven rack. This "oven toast" is usually buttered before toasting. Toaster ovens are special small appliances made for toasting bread or for heating small amounts of other foods. Many brands of ready sliced bread are available, some of which specifically market their suitability for toasting. Left: Toast with butter and vegemite. Right: With butter and strawberry jelly. In modern days, toast is most commonly eaten with butter or margarine spread over it, and may be served with preserves, spreads, or other toppings in addition to or instead of butter. Toast with jam or marmalade is popular. A few other condiments that can be enjoyed with toast are chocolate spread, cream cheese, and peanut butter. Yeast extracts such as Marmite in the UK, New Zealand and South Africa, and Vegemite in Australia are national traditions. Some sandwiches, such as the BLT, call for toast to be used rather than bread. Toast is an important component of many breakfasts, and is also important in some traditional bland specialty diets for people with gastrointestinal problems such as diarrhea. In the United Kingdom, a dish popular with children is a soft-boiled egg eaten with toast soldiers at breakfast. Strips of toast (the soldiers) are dipped into the runny yolk of a boiled egg through a hole made in the top of the eggshell, and eaten. In southern Sri Lanka, it is common for toast to be paired with a curry soup and mint tea. By 2013, "artisanal toast" had become a significant food trend in upscale American cities like San Francisco, where some commentators decried the increasing number of restaurants and bakeries selling freshly made toast at what was perceived to be an unreasonably high price. Toasted bread slices may contain Benzo[a]pyrene and high levels of acrylamide, a carcinogen generated during the browning process. High acrylamide levels can also be found in other heated carbohydrate-rich foods. 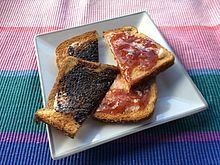 The darker the surface colour of the toast, the higher its concentration of acrylamide. That is why, according to the recommendations made by the British Food Standards Agency, bread should be toasted to the lightest colour acceptable. The slang idiom "you're toast", "I'm toast", or "we're toast" is used to express a state of being "outcast", "finished", "burned, scorched, wiped out, [or] demolished" (without even the consolation of being remembered, as with the slang term "you're history")." The first known use of "toast" as a metaphorical term for "you're dead" was in the film Ghostbusters (1984), in which Bill Murray's character declares, "This chick is toast", before the Ghostbusters attempt to burn the villain with their nuclear-powered weapons. "Hey, dude. You're toast, man", which appeared in The St. Petersburg Times of Oct. 1, 1987, is the "...earliest [printed] citation the Oxford English Dictionary research staff has of this usage." Humorous observations have been made about buttered toast. It has been noted that buttered toast has a perceived tendency, when dropped, to land with the buttered side to the floor, the least desirable outcome. Although the concept of "dropped buttered toast" was originally a pessimistic joke, a 2001 study of the buttered toast phenomenon found that when dropped from a table, a buttered slice of toast landed butter-side down at least 62% of the time. The phenomenon is widely believed to be attributable to the combination of the size of the toast and the height of the typical dining table, which means that the toast will not rotate far enough to right itself before encountering the floor. A joke that plays on this tendency is the buttered cat paradox; if cats always land on their feet and buttered toast always lands buttered side down, it questions what happens when buttered toast is attached to a cat's back. In the first episode of the third season of the Fox musical dramedy Glee, "The Purple Piano Project", Becky questions the necessity of toast, stating "bread's already been baked; I don't get why we have to cook it again." Anton, one of Gumball's classmates from The Amazing World of Gumball is also a piece of toast. Drawing the process of making toast has been featured in a 2013 TED talk by Tom Wujec entitled "Got a wicked problem? First, tell me how you make toast." Cheese and marshmallows are also toasted by exposure to dry radiant heat. A toasted cheese sandwich features toasted cheese and toasted bread. Bagels, English muffins, Pop Tart pastries and crumpets are foods that can be toasted, too. ^ a b c "History Is Toast". The New York Times. 20 April 1997. Retrieved 21 February 2016. ^ a b c d e f Martin, Gary. "The toast of the town". phrases.org.uk. Retrieved 21 February 2016. ^ Shakespeare, William. "Act 3, Scene 5". In Mowat, Barbara A.; Werstine, Paul. The Merry Wives of Windsor. Folger Shakespeare Library. p. 125. ^ Barry-Jester, Anna Maria (March 29, 2016). "Toast Has Been A Fad For 150 Years". FiveThirtyEight. Retrieved March 30, 2016. ^ "FAQs". www.toaster.org. The Toaster Museum Foundation. 2017-01-10. Archived from the original on 2017-01-10. Retrieved 14 January 2017. ^ Desk, News (2016-11-08). "Kingsmill launches loaf of bread designed specifically for toasting". FoodBev Media. Retrieved 2019-02-19. ^ "Egg with Toast Soldiers". icons.org.uk. Archived from the original on 4 March 2010. Retrieved 6 August 2010. ^ O'Dell, J. (21 August 2013). "$4 toast: Why the tech industry is ruining San Francisco". VentureBeat. ^ Gravois, John (13 January 2014). "A Toast Story: How did toast become the latest artisanal food craze? Ask a trivial question, get a profound, heartbreaking answer". Pacific Standard. ^ a b Jackson, L.S. & Al-Taher, F. (2005). Effects of consumer food preparation on acrylamide formation. Adv. Exp. Med. Biol. Advances in Experimental Medicine and Biology. 561. pp. 447–465. doi:10.1007/0-387-24980-X_34. ISBN 978-0-387-23920-0. PMID 16438318. ^ "Acrylamide". food.gov.uk. Food Standards Agency. Archived from the original on 25 January 2014. Retrieved 25 February 2014. Chisholm, Hugh, ed. (1911). "Toast" . Encyclopædia Britannica. 26 (11th ed.). Cambridge University Press. p. 1035. ^ Matthews, Robert (27 May 2001). "Breakfast at Murphy's (or why the toast lands butter-side down)". The Daily Telegraph. London. Retrieved 19 December 2012. ^ Devlin, Keith (July 1998). "Buttered Toast and Other Patterns". Mathematical Association of America. ^ Mcdermott, Nick (3 September 2013). "Why your toast falls butter side down: Scientists finally uncover the reason... and it's all to do with the height of the table". Daily Mail. ^ Freeman, Bobby (1996). First Catch Your Peacock. Y Lolfa. p. 154. ISBN 978-0-86243-315-4. ^ Brocket, Jane (2009). Turkish delight & treasure hunts: Delightful treats and games from classic children's books. Penguin Group. p. no page number. ISBN 978-1-101-44325-5.